Erik Hansen, Peter Prosper Jr.
CLAUDE BARIBEAU — La seigneurie de la Petite-Nation (1801-1854). Le rôle économique et social du seigneur. LAURA S. STRUMINGHER — What Were Little Girls and Boys Made of? Primary Education in Rural France, 1830-1880. J. R. POLE — The Gift of Government: Political Responsibility from the English Restoration to American Independence. | JOYCE APPLEBY — Capitalism and a New Social Order: The Republican Vision of the 1790s. RÉAL BÉLANGER — L'impossible défi. Albert Sévigny et les conservateurs fédéraux (1902-1918). MICHAEL CRATON — Testing the Chains: Resistance to Slavery in the British West Indies. GREGOR DALLAS — The Imperfect Peasant Economy: The Loire Country, 1800-1914. WILLIAM H. HUBBARD — Familiengeschichte, Materialien zur deutschen Familie seit dem Ende des 18. Jahrhunderts. MARTINE SEGALEN — Love and Power in the Peasant Family. Trans. by Sarah Matthews. GEOFFREY HOLMES — Augustan England: Professions, State and Society, 1680-1730. PAUL T. PHILLIPS — The Sectarian Spirit: Sectarianism, Society and Politics in Victorian Cotton Towns. B. C. CUTHBERTSON and JEAN PETERSON, eds. — The Loyalist Guide. Nova Scotia Loyalists and their Documents. THOMAS R. OSBORNE — A Grande École for the Grands Corps. The Recruitment and Training of the French Administrative Elite in the Nineteenth Century. ELLEN G. FRIEDMAN — Spanish Captives in North Africa in the Early Modern Age. BARBARA KETCHAM WHEATON — Savoring the Past: The French Kitchen and Table from 1300 to 1789. DONALD H. AKENSON, ed. 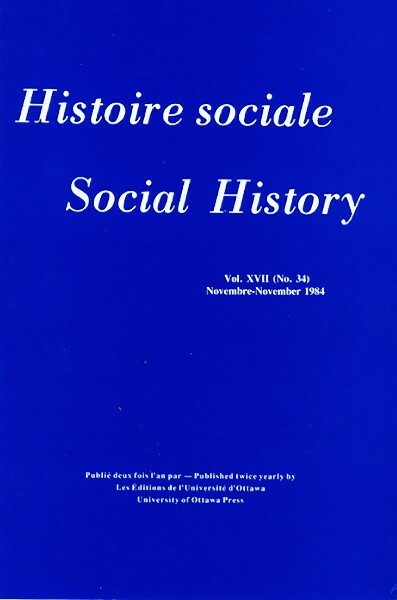 — Canadian Papers in Rural History, Volume IV. STEVEN MINTZ — A Prison of Expectations: The Family in Victorian Culture. TERRY PARSSINEN — Secret Passions, Secret Remedies: Narcotic Drugs in British Society, 1820-1930. CHRISTINE PIETTE—Les Juifs de Paris (1808-1840): la marche vers l'assimilation. HERVÉ COUTEAU-BÉGARIE — Le phénomène « Nouvelle histoire ». Stratégie et idéologie des nouveaux historiens. G. V. SCAMMELL — The World Encompassed: The First European Maritime Empires c. 800 - 1650. MICHAEL DRAKE, ed.—Population Studies from Parish Registers. M. J. DAUNTON — House and Home in the Victorian City: Working Class Housing, 1850-1914. JEAN-PIERRE BARDET — Rouen aux XVIIe et XVIIIe siècles. Les mutations d'un espace social. PETER DESHAZO — Urban Workers and Labor Unions in Chile, 1902-1927. MANOLY R. LUPUL, ed. — A Heritage in Transistion: Essays in the History of Ukrainians in Canada. | FRANCES SWYRIPA and JOHN HERD THOMPSON, eds. — Loyalties in Conflict: Ukrainians in Canada During the Great War. FRANCIS JENNINGS — The Ambiguous Iroquois Empire: The Covenant Chain Confederation of Indian Tribes with English Colonies from its Beginnings to the Lancaster Treaty of 1744. CHRISTOPHER MOORE—Louisbourg Portraits. Life in an Eighteenth Century Garrison Town.